Walt Flood Realty, specializing in MLS Sales/Listings, Long-Term Rentals, and Property Management in Honolulu/Waikiki, Hawaii. 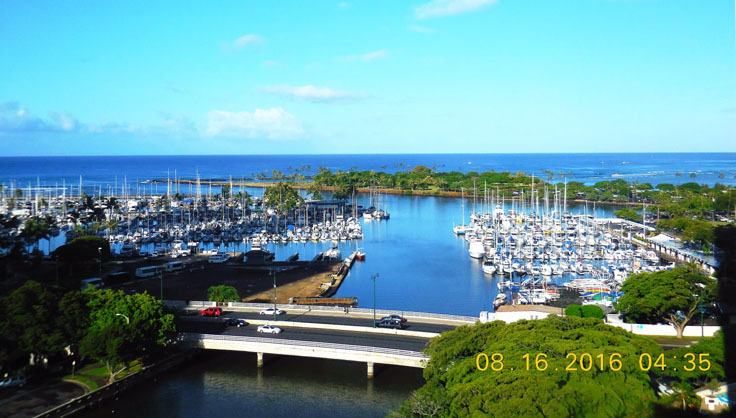 Stunning Ocean, Ala Wai Canal, City and Mountain Views! Notice/Update: This will be the first time that a High Floor, End Unit with unobstructed Ocean, Harbor and Canal views, since the sale of unit #1208 at $425K in year 2009. 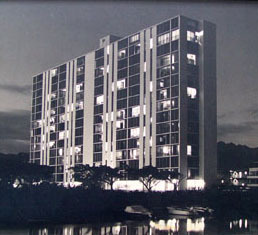 This 15 story high rise building is a block to the Hawaii State Convention Center; across the street from the Ala Moana Hotel; behind Yacht Harbor Towers and the YMCA complex (now closed); one block to the Ala Moana Shopping Center, Ala Moana Beach Park (Magic Island), Pacific Ocean, and at the entrance to Waikiki. This 11th floor Condo apartment has a large enclosed Lanai. There are Two Bedrooms, a Studio and One Bathroom. Note: The Studio could be a Office, or a third Bedroom (145 sq.ft). The apartment is partially furnished (appliances). There is a Washer and Dryer in the apartment. The rooms have laminate/tile, carpet, or hard wood floors. Atkinson Towers is a secured building, with two elevators, and there is a Maintenance Manager. The swimming pool is being removed, to create twelve (12) addtional parking stalls. There are Individual Owners' assigned storage/lockers on each floor. Basic cable TV, and High Speed Internet are included in the Maintenance Fees, No Pets are allowed, with the exception of certified seeing-eye dogs. 1. Is Atkinson Towers a Cooperative or a Condominium? 98% of the units have already been converted to Condominium, but two (2) of the units are still known as Co-Op, so the project is known as ″Mixed-use″ building. Unit #1108 is a Condominium. 1. The new Owner submits a Parking License Leasehold Agreement for covered parking stall #34. Maintenance Fee becomes $873.00 per month including the parking stall. 2. The new Owner doesn't have a car, or doesn't want a Parking Stall on Atkinson Towers property. The Maintenance Fee will be $549.00 per month, starting on January 1, 2019. 3. What about financing? Credit Unions, Bank of America, Wells Fargo and most of the Mainland Banks/Lenders will NOT write a mortgage on Atkinson Towers, because it's a Mixed-use project (Coops and Condos). NEW - Announcement: Sandalwood Home Loans will write a conventional mortgage with 10%-20% down payment for 30-years fixed (Owner Occupants). Bank of Hawaii, Central Pacific Bank and First Hawaiian Bank will write a ″Portfolio″ Loan at 20%-30% down for Owner Occupants/Investors. 4. What about Seller's financing (Agreement of Sale)? Not available at this time. 5. Future? There is a good chance, over the next 2-3 years, all the Co-op stockholders will convert to Condominium, and the building will NOT be a mixed-use project. All the financing will go back to Conventional (FHA, etc.). 6. What are included in the Maintenance Fees? Building/Flood/Fire insurance, Resident Manager and staff, water, sewage, elevator maintenance and waste/trash removable contracts, and Basic TV cable, and High Speed Internet. The electricity (HECO) is paid by the Owner or Tenant for unit #1108. 7. What about air conditioning? It is possible to install A/C, with portable window units, with AOAU approval. 8. Why are the owners selling this condo? The Owners/Sellers, as Investors, want to down-size for retirement. Interior Area: 1,050 sq.ft, which includes the enclosed Lanai. Maintenance Fee: $549.00 / Other Monthly Fees: Parking Stall Rent: $325.00. Total Monthly Fees/Charges: $874.005 (Year 2019), / Plus: Property Taxes: $125.00/month (2017). Bedrooms: Two / Bathrooms: One / Covered Parking Stall #34. Click here: How To Buy Unit #1108. Read the step by step on making an offer (Purchase Contract) to buy Condo Unit #1108. House Rules - Plus (40 pages). Click here for Multiple Picturestaken from inside #1108, a view of the building, views to the Ocean and to Waikiki.